Each aux send on your mixer enables you to create a unique mix that is different from the main mix. This explains why aux sends are primarily used for monitor mixes. So, if you have four sets of aux sends, you can have four unique monitor mixes in addition to your main mix. So, let’s go through how to use aux sends for monitor mixes step by step. On the back of your mixer, there is a section labeled ‘Aux Sends’. This is the output signal for each aux send on your mixer. You need to use a balanced cable to connect the aux send to the monitor. You are most likely using a stage snake to get the signal from your mixer all the way to the stage. Rest assured that every cable in the stage snake is balanced. For all other cables used, make sure they have either an XLR connecter (like those used on a microphone) or a TRS connector, as both of these indicate a balanced cable. Keep in mind, it is easy to confuse a TRS connector with a regular instrument cable connector. They are both 1/4” connectors, but if you look close, the TRS connector has two rings whereas a regular instrument cable has only one. An instrument cable is unbalanced, and if you use it instead of a balanced cable, you will get all kinds of unwanted noise. Now that you have the right cables, it is time connect your monitors. If you are using passive speakers, the aux send will connect to the amp that is powering the speaker. If using powered speakers, the aux send will connect directly to the speaker. If using in-ears, the aux send will connect to your headphone amp. Once everything is connected, you are ready to head back to your soundboard and create the mix for your aux send. Towards the right of the sound board, there is a section labeled ‘aux sends’ or ‘aux masters’. These knobs control the overall output of each aux send. I recommend setting these to 0 (or 12 o’clock) to start things off. Now go through each channel to create the desired mix. Once you have a mix you are happy with, make sure you are sending a strong signal to your monitors. To do this, head back over to the section on your soundboard that controls the overall output of the aux send and engage the button labeled ‘solo’ or ‘AFL’. This will activate the level meter on your mixer to show you what type of signal is flowing through the aux send. Much like setting the gain, you want this signal to be consistently around 0dB. Use your aux send master volume knob to achieve this. Keep in mind that this is something you should check on a regular basis. As you make adjustments to the monitor mix, the overall output will change. If you forget to check on the output level of the aux send, you may be sending a weak signal or one that is peaking out and distorting. Aux sends are normally pre-fader by default. However, most mixers have a PRE button which allows you to chose whether the fader at the bottom of the mixer should affect the volume of the aux sends. PRE is actually short for ‘pre-fader’. So, If PRE is active, the fader at the bottom of the mixer will not affect the aux sends. If PRE is inactive, that means the aux send is post-fader and the fader will not only adjust your main mix, but the aux sends as well. In most cases, PRE should be active so that your fader does not affect the aux sends – especially when used for monitor mixes. Most likely, the only time you do not want to use the PRE option is when connecting a device that plays pre-service music. Otherwise, when you fade out the music, it will still be be playing through the monitors. Unless your soundboard allows you to choose (which most do not), aux sends are post EQ. So, when adjusting the equalizer on your mixer, this will affect not only the main mix, but the aux sends as well. For example, if you are using your aux send for a monitor mix and you cut the lows out of a vocal, the lows will be cut in the mains as well as the monitor. When we use our Aux out for monitors, however we only get one side at around 75% of the volume, and the other is at 25% for each In-Ear Monitor. Do you have an idea of what is causing this issue? We are using XLR to 1/4″ TRS to get from our snake to the headphone distributors. You are using the right cables, so my guess is that the problem is with your headphone amp (distributor). Make sure you have it set to ‘mono’ if it has a mono/stereo option. This is the only thing I can think of that would be causing that type of problem. I have a PreSinus StudioLive console and it’s connected to an ART HeadAmp 6 Pro. Im looking to create 4 steaero monitor mixes, but Im not 100% how to hook it up. Im thinking I just link aux 1 & 2, connect aux 1 & 2 from the back of the board dirsct to the headphone amp in channel 1. My question is, do I use a balanced cable between the monitor and headphone amp? And, if so, Imll need a Y cable, but do they even make Y cables balanced? I cant find them. There is no such thing as a balanced stereo cable, but as long as you run the majority of the length through two balanced cables, you should not have problems with noise. For example, Aux 1 & 2 would run to the stage through the stage snake (which contains all balanced cables). Then, you would use a Y cable (like this one) to connect Aux 1 & 2 from your stage snake to the headphone amp stereo input. This keeps your unbalanced cable run short, saving you from unwanted noise. Do passive monitor need to connect to a external power amp? You are correct, Edie. Passive speakers require an external power amp whereas active speakers have the amp built in. Hi. I’m using passive speakers for my monitors. My question to you is can I use a power mixer to power my speakers? I have a europower pmp2000 and if I can how do I do it? Hey Robert – You can definitely use your powered mixer to power your speakers. You just need to connect your speakers to the speakon ports on the back of your mixer. Hope that helps! Haha…time for a bigger mixer, I suppose! Wow this is a great site—thank you Kade. I have a presonus mixer and I need to set up two stage monitors. I have a snake that runs from the presonus to the pulpit. What type of cable would I use to connect the monitors to the snake? These would be powered monitors. Thanks, Alex! You’ll want to use the returns on your snake (usually labeled in letters – A, B, C, D). If these connections are XLR male, then you’ll just use a regular microphone cable to connect to your speakers. If connections are 1/4″, you’ll need a cable with 1/4″ TRS connection on one end and XLR male on the other (if your speaker accepts XLR connection). Hope that helps! We use an LS9 at my church. On the LS9, we have an EQ set up for the input channel (e.g., female singer) which is also sent to MIX 1 (wedge monitor on-stage). On the LS9, when we go to the MIX 1 window, there is also an EQ setting for that. What does this mean? Is MIX 1 sending to the wedge monitor a combination of the EQ of the channel AND the EQ set for MIX 1? I cannot find an answer to this on my manual. Hey Miguel. In this case, both the channel EQ and the MIX EQ would be sent to the monitors. For further clarification, the channel EQ affects only that channel, wherever it is sent (main mix, monitor mixes, etc). The MIX EQ is an ‘overall’ EQ for everything send to that MIX. So, if you have a vocal and guitar sent to that mix, they would both go through the MIX EQ (after the own channel’s EQ). Hope that makes sense! Side note: On the X32, you can set a channel send to ‘PRE EQ’ so that channel EQ is not sent to the monitor mix. I scanned the LS9’s manual to see if this was an option on your mixer, and it doesn’t look like it. I wish I knew this two weeks ago! I had to mute the channel abruptly in order to cut the sound from the wedge monitors, which defeats the purpose of the much wanted slow fade-out of our PC music. Regarding the AUX sends and monitor mixes. I have a box-type powered mixer and few passive speakers that are used both for main and monitor speakers. Does AUX sends carry amplified signals to my speaker or do I need a separate power amplifier to power my speaker? Hey Marvin – thanks for the comment. 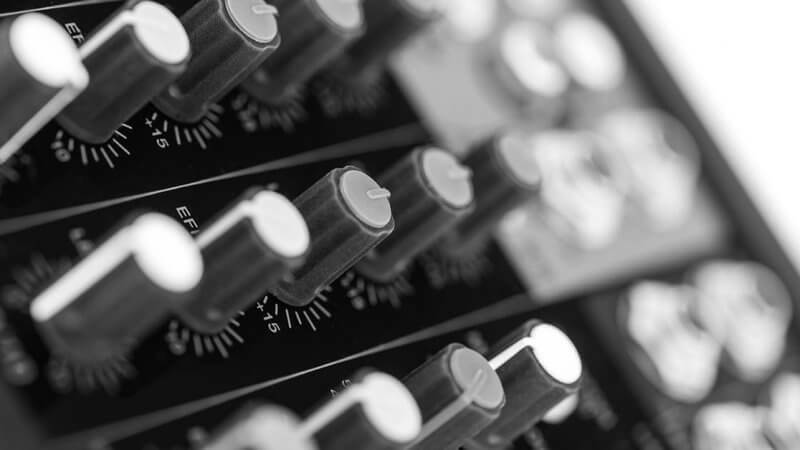 On powered mixers, generally only the main outputs are powered, the aux sends are not. So, you would need a separate amplifier for your aux sends. Yes, your mixer only has one aux send (monitor send). You can still hook up two speakers for monitors, but they will share the same mix. To do this, connect you first speaker to the ‘Mon Send’ output on your mixer, and then connect the second speaker to the ‘thru’ or ‘line out’ on the first speaker. Hope that helps! We are using a Berhinger X2442USB mixer at church. We have 2 active Mains,and 1 active Monitor in choir loft. We want to use a split-track accompaniment DVD for a Christmas program. If I pan to Right it cuts out the accompaniment vocals to the Mains out to congregation, but not to my Monitor in choir loft. Do I use my Monitor “post” fader to achieve this? Hey Zach – Aux sends are not affected by panning, even when set to post fader. The best solution here is to use two separate ‘mono’ channels on your mixer instead of a stereo channel. For example, you could connect the L signal from your DVD player to channel 1 and the R signal to channel 2. Then you have full control over what goes where. Hope that helps! You can definitely use the two aux sends to create two different monitor mixes, but you will most likely need two different headphone amps, unless your headphone amp allows you to route multiple inputs to different headphone outputs. Warning: long message my apology in advance. First of all I praise and thank God for people like you who share their expertise to help others. Only last month, God’s mercy I created a Youth and Children’s band, we are trying to do an Acapella song which is a bit challenging at the moment because we have short time to practice plus the fact that everybody is young quite & new to the team and to singing acapella. Though everyone is talented & keen to do it & sounded great. I am thinking of a back up plan or contingency plan incase some of the good ones will have emergency problem that they could not perform. Just like what happened few days ago. Now I am thinking of sending the original track of Acapella to the earphone monitors of everybody so they can follow the track & sing without sending it to main front speakers for this coming last 2 practices and during the the Church Carol performance so they can keep the timing and be more confident about the notes that they are singing because they can hear it. Is it possible to do this?Sending music track to selected earphone monitors without sending to the church main speakers, so people would not hear the music track but only their voices, at the same time they can follow the music track on their ear? I am so sorry for the long message. God’s abundant blessing to you, your family and ministry this Christmas season and the rest of the years to come! Hey Dennis – This is definitely possible. All you need is a headphone amp (something like this: https://amzn.to/2SHafsV). Then, you’d connect the Aux/Bus output of your mixer to the input of the headphone amp. The link above will lead you to a headphone amp with 8 channels. If you have more than 8 singers, you may need to find a different one or purchase multiple. Who’s here in 2019 trying to figure out an analog set up for his in-laws to start live streaming. Our soundboard is located up in our balcony and has four AUX channels, but only two are accessible on the panel down on the stage via 1/4″ connectors. Any idea how we could utilize the other two channels so the band could have four loops rather than just two? I’ve been wondering if using two active monitors combined with two wireless transmitters might work. I’m worried that the wireless transmitters wouldn’t be up to the task though since it seems most are branded for use with a single instrument rather than a whole mix like your point about the difference between instrument and TRS connectors. I’m also wondering if maybe the same effect is possible by utilizing the pan on the two existing channels. I’m new to the world of mixing and trying to learn as much as possible to help out the church. Hey Sam! Great question. A wired connection would be best for this. Aux channel is not sending signal to monitors. The other aux sends will send to the monitors but aux one is dead. Any suggestions on how to fix this? Sounds like you have a dead channel. Unfortunately, that happens sometimes. Usually, this is a hardware issue which means you should probably take it to a repair shop to see if it can be fixed. The youth in our church run our sound system. The mixer is a Presonus digital performance and recording mixer studio live 16.0.2. No one in the church has any expertise with this type of thing and we usually just figure things out as we go along. (It was professionally installed and set up years ago.). While conducting a Google search about a problem we have, I came across this discussion and hope you can help. Our minister says that this is a new development. I don’t know because I rarely speak into the podium mic. Can you help? Hey Charles – very strange problem indeed. Do you still not hear anything through the monitors when you turn the podium mic’s aux knob on the way up for the monitors?